I thought I might start this post with a cliche: what a year!? insideways is still a baby blog (can you believe the first post was in January of 2011? Only one post for the whole month haha! 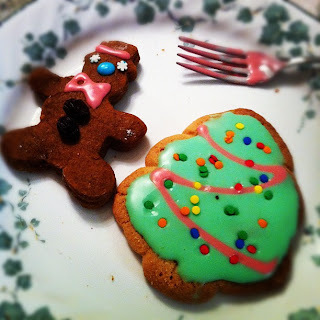 ), but I thought it woud be fun to look back on some favorite posts of 2011. I hope you enjoy this little jaunt into the past - you might even see some posts you missed! Fun posts are the best way to start right? I'm continually amazed at how taste and style evolves over time. This post features some some design elements I can't believe I used to hate! Do it yourselfers are taking over! As funny as it is to fail, succeeding at a project feels pretty dang fabulous. Here are some of my favorites from this year. This year I made the shocking discovery that I love plants and CAN keep them alive. Oh succulents, you know I love you and love putting you in all kinds of pretty containers. Here's an old find you might not have seen. Now it hangs here. I'm kind of obsessive about details sometimes… it can be a good and bad trait, but I think it makes for some pretty helpful How-To's. 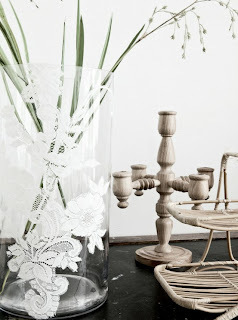 What would a decor blog retrospective be without a look back at some of my favorite spaces! Well, I hope you all have had as good a year as I have. Thank you for taking time out of your day to visit my little corner of the internet!! Next year promises to be another great one and I'm so grateful to be able to share it with you lovely readers. Here's to 2011 and to an even better 2012! If you're a regular reader of this blog, you might have noticed a have a little obsession with succulents (check it out here and here if you want to catch up). 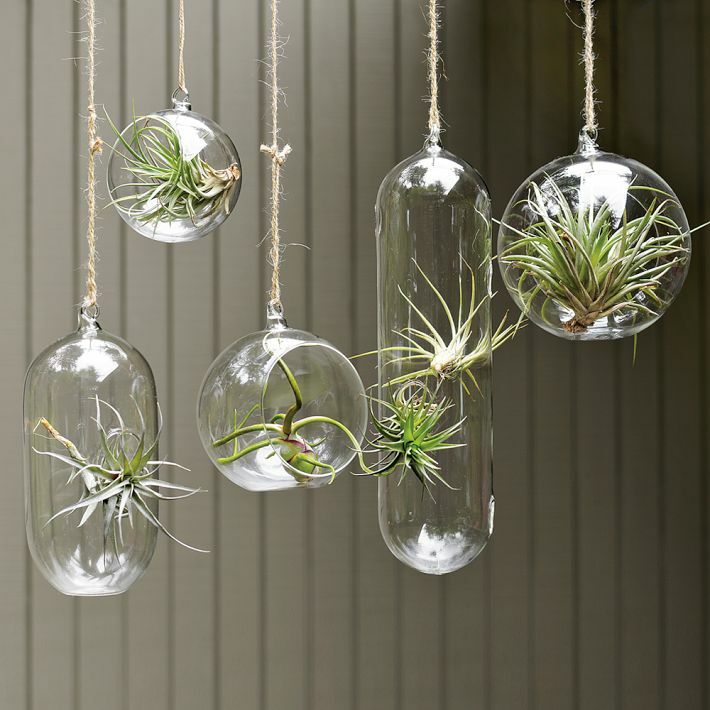 Well I've been harboring another secret plant crush - air plants. Oh air plants you pretty things, I'm going to say it publicly - I love you!! The hunting grounds were beautiful! 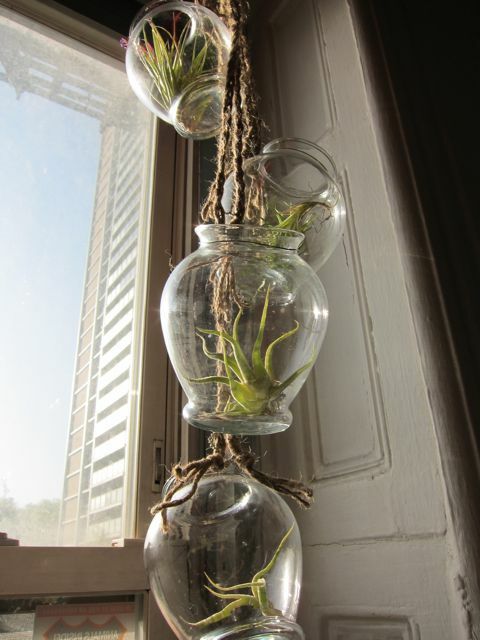 I even took a picture of a few baby air plants so you can ooh and aww over how cute those little guys are. Just took a little patience but now the air plants and I can live together forever (or as long as air plants happen to live). 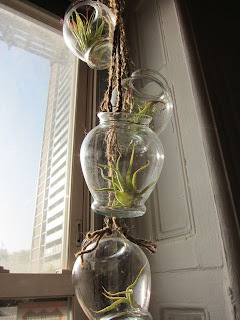 Hanging air plants from Craftaholics Anonymous (tutorial!) and West Elm. 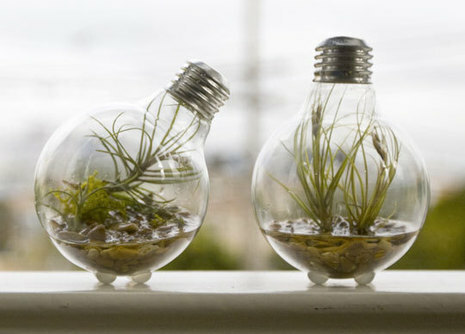 And the super adorable air plants in lightbulbs featured on Curbly. What do you think? 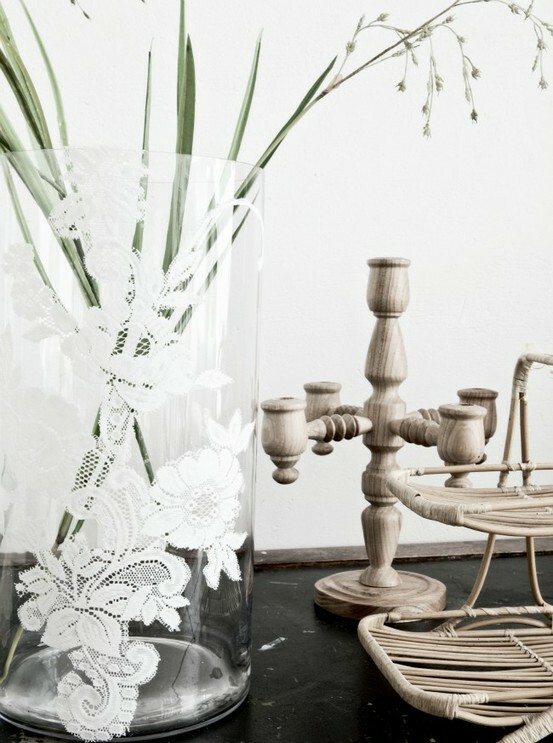 Are you a sculptural plant person (ie succulents/air plants/cacti) or a flower person? Another Pinterest DIY tackled! This one was from a project I spotted on Sarah's blog, Renewed Upon a Dream - one of the sweetest bloggers out there, definitely check her blog out! She made these amazing teacup candles and I though "WHAT!? You can make your own candles and they can be in anything!?" Yep, mind blown. Once my mind recovered from being blown I thought "hey, those would be fabulous Christmas gifts..." And now your saying "hey Jen, I'm so burned out on Christmas and it's OVER so stop talking about it." Ok ok sorry I get it. Anyway, since these were a gift I had to wait to post them until after Christmas. PS they were a humungous hit. Yay! Mine didn't turn out as picture perfectly as Sarah's did, so be sure to follow her tutorial if you try this for yourself (I got lazy). Maybe I'm a crazy person, but I love spending the holidays with my family. We're a giant clan of 8 aunts/uncles, 13 cousins, 5 in laws, and my Grandmother - the great matriarch. I love em all! My Aunt Elizabeth was a huge influence on my love of all things crafty. Of course, she brought cookies for us to decorate! She could only keep my brother and I serious for so long though. BEWARE THE ANGRY TREES! 1. Heat the oven to 200 degrees. 2. Put a layer of pretzels on a cookie sheet. 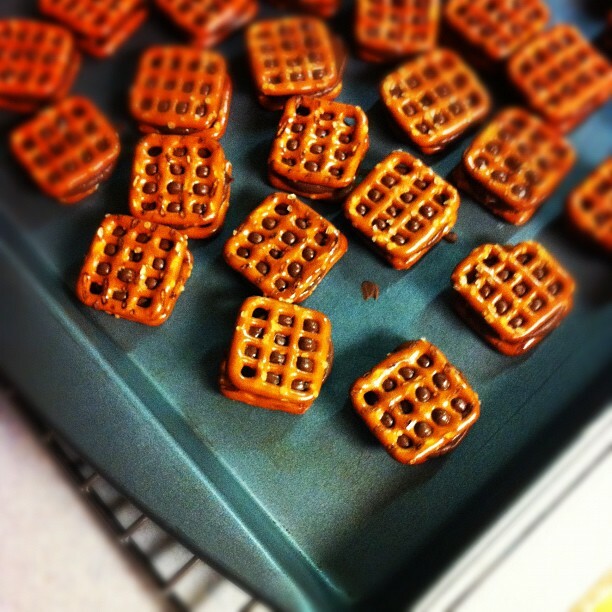 Put one chocolate on each pretzel. 3. Heat in the oven for 2 minutes. 5. Let the treats cool then EAT! 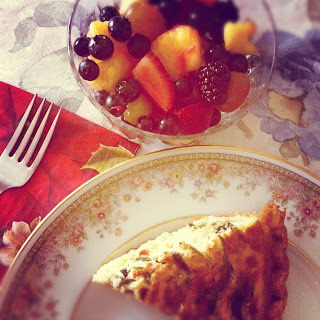 I don't plan becoming a recipe blog, but I couldn't help but put that in there. So easy, so cheap, so good. Oh right, the loot. All of my gifts were really special and I feel so grateful that my family took the time to find the perfect ones for me. They're the best and seemed to like my gifts for them too! Some that stood out for bloggy purposes... 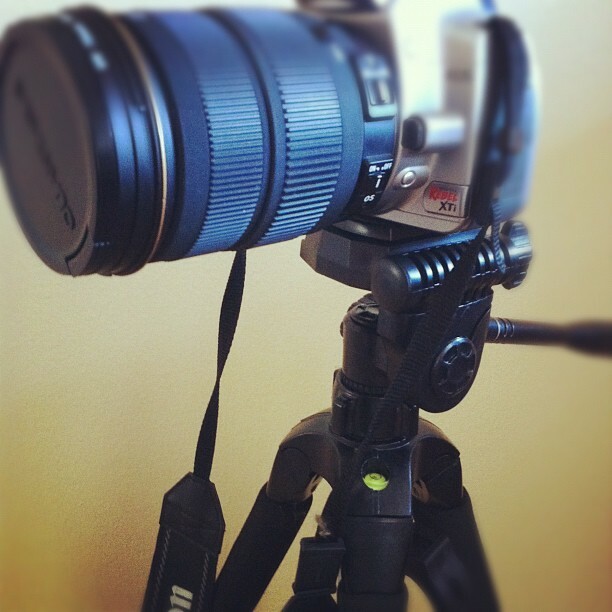 I got a tripod and remote for my camera and photoshop!! Eeeeee! I can't wait to share my new and improved pictures with you, once I get past the photoshop learning curve. That reminds me, would anyone be interested in a series of posts where we learn to use photoshop together? Just email me or leave a comment. If there's interest, I'm totally down. If you follow me on pinterest, you'll recognize this shark print and sandwich coasters from my WANT! board. Gotta say, easiest Christmas wish list ever. I can't wait to frame Mr. Shark and add him to my growing art gallery! I snagged a few other little goodies from the local thrift stores, but haven't had time to take pictures yet. Gotta say, the FL thrift stores are out of control awesome. How was your Christmas? Any goodies you're especially pumped about? Family bliss or can't wait for some alone time? I'm officially off in Florida for some serious friend and family time! Woo! One goal I have for my holiday vacation is to finally put together an About page for this here blog of mine. Why don't I have one yet? I have no idea or good excuse. The picture above is from a little photo shoot I just did with my best friend. We had a fabulously girly time, and I finally have a photo of myself I'm really excited to use on my About page. My #1 excuse for procrastination is gone! So, a ginormous happy holidays to all of you amazing readers!! I hope you get to indulge in a little relaxation, see family or friends or both, and do whatever it makes you happiest in this super cheery time of year! It seems like there's a recurring question for my when it comes to gift giving during the holidays: to make or to buy? I can definitely relate to the feeling of not wanting a thrown-together "craft" or the leftovers of someone's hobby, but handmade with care gifts feel so special too! Tim has a new tablet and asked for a custom case - what a great chance to make the perfect gift and dust off my old friend the sewing machine! We chose all of the fabric together making sure to find a durable outer fabric and a super soft lining. A little canvas ribbon was the perfect custom add on. 1. Desperately try to remember how you made that purse with lining once. 2. Cut and sew on the fabric as best you can with your fingers crossed. 3. Did it work? Phew! Since we're spending Christmas with our families, I gave him his gift a little early so don't worry, the surprise wasn't spoiled via the internet. Whatcha think - do you like getting handmade or store-bought gifts? Then just to take it to the next level, I combined two Pinterest inspirations together. Wheee! Also, can you believe I've never used Mod Podge before!? It's awesome. I'm in love. There will be more of it on this blog in the future, this you can be sure of. This post is joined in a link party! My fiber obsession continues to blossom with the wall art I was so happy to find in a thrift store this past weekend. Potted plants and seagulls anyone? The big plant piece was $4 and the little seagull was $1.30. I'm really digging the colors of both and I about died over the sparkly gold thread used on the seagull. Glamour. I've decided to hang the art up in an organic grouping (like almost all of the art in my house really) because I want to add to it over time. With a grid or symmetrical grouping it would be nearly impossible to add one piece of art at a time, but with this set up I just find the perfect spot as I go - perfect for a hoarder collector like me. I'm still working out the styling of the chair/floor in the hallway so more updates are sure to come. What are your hallway solutions? 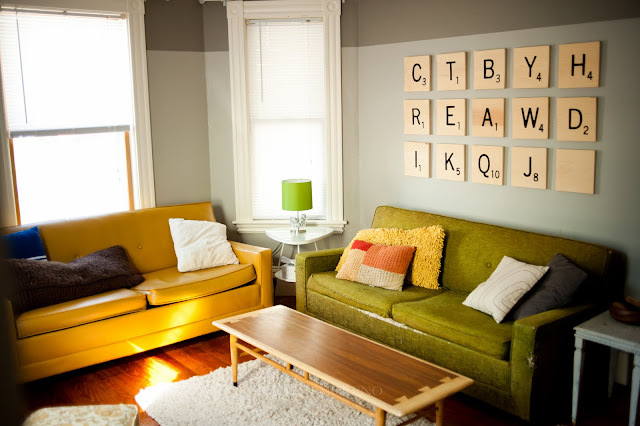 Are you a symmetrical or random wall art kind of person? Remember when I shared the ugly frame I updated with orange spray paint? I'm so happy with how it turned out and I've been really excited to fill it with some DIY art. 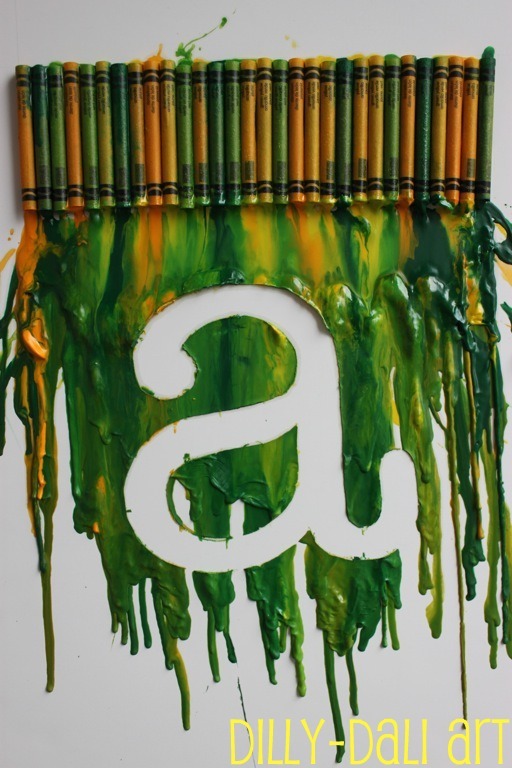 I love the crayon drip art I've seen floating around Pinterest and have been dying to try it! 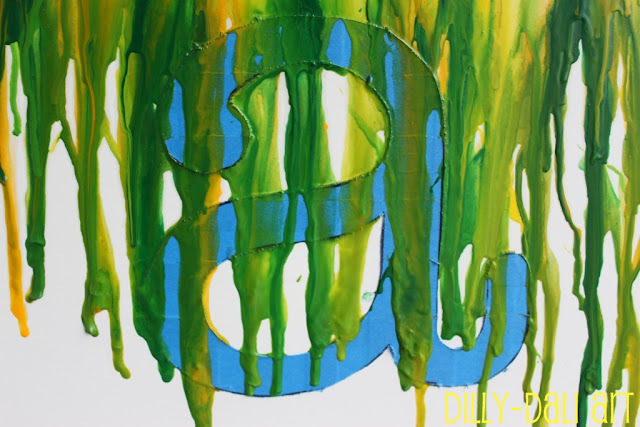 Like this awesome drip art by Dilly-Dali Art! 1. Glue your crayons to a piece of flimsy paper. NOTE: Make sure the paper has no support so it will be difficult to hold when you start to blow dry the crayons. Also, you might want to try wood glue first (especially if it's the only glue you have). Hot glue woud work better, but it's best that you discover that when you realize you don't want to wait 24 hours for the wood glue to dry. 3. Panic. Decide the bathroom is the best place for this mess. Run in, plug in your hairdryer, continue to melt the wax into the sink. This mess will take you twice as long to clean up as the drip art itself takes to make. NOTE: You did not need to run to the bathroom at all, you could have taken a second to make a good plan. You will never know why you thought this was a good idea. 4. Melt the wax until you've decided you have made a sufficient mess. You will also now realize you don't like the colors you chose and that the shape you chose to tape off for artsy coolness is completely obscured because of the way your wax dripped. 5. Remove the tape anyway hoping for the best. Nope... definitely can't tell what it is. This is also where you will discover the wax bled beneath your tape a little. Bummer. 6. Decide to trace the outline of your heart with crayon for clarity. It will make things worse. 8. As a last ditch effort, put your "artwork" in the pretty frame you have, hoping it will make things better. It wont. Yep. I hate it. If you like it, then I completely respect that... but I don't. I'm totally down with whimsy, playfulness, kitsch even, but... this doesn't work for me... maybe in a kid's room? If the kid had made it? I decided to do it. This brass duck bowl was just screaming for succulents so bam, here they are. So pretty! Have you used any non-traditional planters? Did your plants survive the experiment? Would you believe that I've lived on my own for 8 years now and have never had a Christmas tree? Tis the year to make that happen. As I mentioned in this post, I've been a little hesitant to collect holiday decorations because I have a small space with very little storage. BUT, after seeing this really sweet little paper twig tree on sale for $9, I knew I'd found a solution that would work for my lifestyle. I heart Tim's snowman wrapped in yarn SO MUCH. As we shopped for supplies I saw these little silver pinecones, so I hot glued some felt, thread, and a button to make those little ornaments. The rest of the tree is decked out with set of matte, shiny, and glitter silver balls to fill out the tree (made of plastic to avoid kitty breakage). No tree is complete without a christmas tree skirt. I decided to make my own with some felt, buttons, and ball fringe. Love! I also added some coral and a few extra pine cones to chill out down there with the tree skirt. I think the coral kind of looks like snow or snow flakes, so I figured it works haha. We hung up some wintery art behind the tree since is just a stick after all and looked a little bare without my November frost photograph or Tim's abstract snow picture. Last but not least, I stuck a little santa hat on my owl light switch cover - I thought he should join in on the fun! All together now, here's our little corner of Christmas cheer! Have you put up your tree yet? This post is part of The Tuckers Take Tennessee's Link-Up. Check it out here. 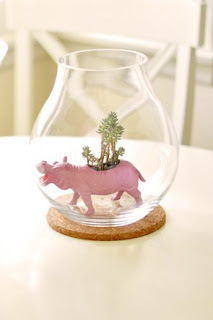 Also, I linked up to Funky Junk Interior's Handmade ornament link party here.